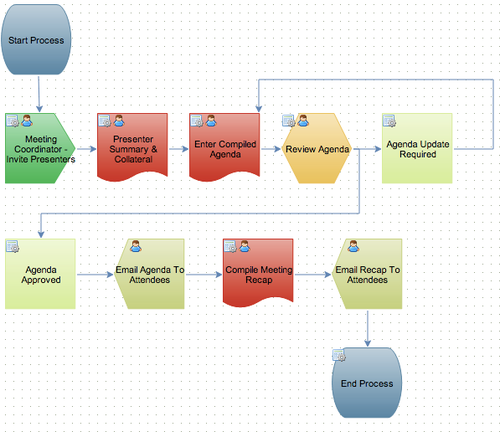 Let's start with a common example: The Quarterly Meeting Process. For the larger organizations out there, the Quarterly Meeting can be quite an event. Even in its simplest form, there’s lots of prep work involved, agendas to send out, notes to take during the meeting and finally, a recap sent out to everyone to set the course for the next 3 months. Let's keep it (very) simple to start with and create a process in Integrify to handle the steps described above. Agenda Review: The compiled agenda is reviewed by Management using an Approval task. It will cycle back to the Meeting Coordinator until everyone approves at which point, the process will move to the following step. 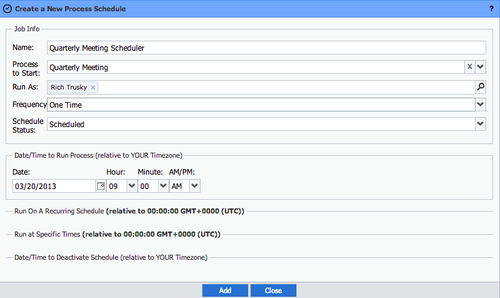 As you can see in the screenshot above, we set the schedule to activate at 9:00 AM on March 20th EDT (My Timezone). This is the time that the server will begin processing the schedule. 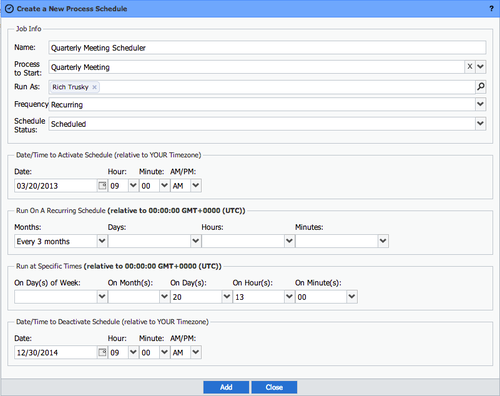 The actual date/time that the process will be triggered is based on the Recurring Schedule and Specific Times Sections. 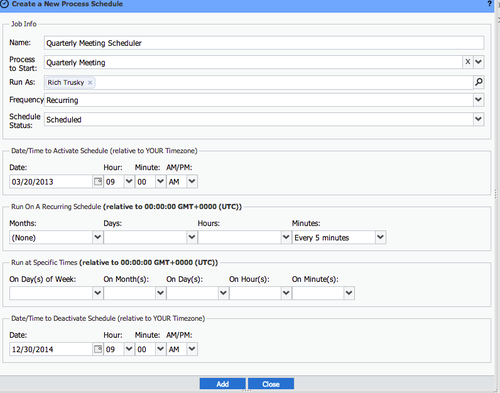 Recurring schedules run based on the timezone of the server. In our case, we see that the server timezone is UTC so we need to do a little math to translate to our EDT timezone. We want the schedule to run on the 20th of March, June, September, and December. Since we know that the server is in the UTC timezone and that the 3rd, 6th, 9th and 12th months will overlap with the same months in EDT, we are safe selecting Every 3 Months from the Recurring Schedule section. We also need to set the schedule to kick off on the 20th day so we select day 20 in the On Day(s) column of the Specific Times section. The last thing we need to do is set the time to trigger the process. We want it to happen at 9:00 AM EDT. EDT is 4 hours behind UTC so we need to ADD 4 hours to 9:00 to get the corresponding UTC time. Based on the 24-hour clock used, this would be hour 13. We also set the minutes to 00 so that it happens at the top of the hour. The screenshot above shows this entire setup. If we had the same scenario above but wanted the schedule to run based on Pacific time (UTC-7), we set the On Hour(s) column under the Specific Times section to16. Central time (UTC-5) would be 14. If all of this confuses you, check out timeanddate.com. They have a timezone converter that you can use to double check your settings. Below are some additional screenshots with an explanation on how they would run.